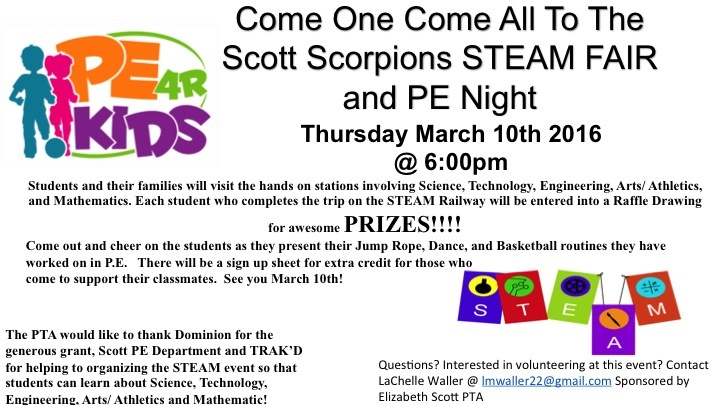 TRAKD will hold a STEAM Fair at Elizabeth Scott Elementary School, March 10 @ 6:00pm. Students and their families will visit the hands on stations involving Science, Technology, Engineering, Arts/ Athletics, and Mathematics. Each student who completes the trip on the STEAM Railway will be entered into a Raffle Drawing for awesome PRIZES!!!! Come out and cheer on the students as they present their Jump Rope, Dance, and Basketball routines they have worked on in P.E. There will be a sign up sheet for extra credit for those who come to support their classmates. See you March 10th! The PTA would like to thank Dominion for the generous grant, Scott PE Department and TRAK’D for helping to organizing the STEAM event so that students can learn about Science, Technology, Engineering, Arts/ Athletics and Mathematic! Questons? Interested in volunteering at this event?